In addition to writing many seforim, Rav Fine was the Rosh Yeshiva of Yeshivas Beth Yehuda which during the 1930’s had an enrolment of more that 30 students. I remember he is lot 4.
the cemetery documents were wrong we found out through our investigations. Rav Fine came to the US from Moscow, where he first served as a Rabbi, after escaping from Kovno, Lithuania. The Rav wrote many Seforim which are avilable on Hebrew Books website. Just was reading this sefer of his: http://www.hebrewbooks.org/2100 – quite interesting. 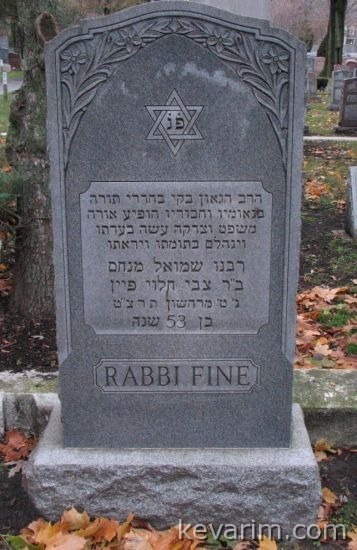 Rabbi Fine was my great grandfather and I am trying to piece together my family’s lineage. His wife, Chaya Sarah (Katz) Fine, for whom I was named, had two sisters, Duba and Nechama. Duba came to Detroit but Nechama emigrated to Israel and she had children. The last I know is that her descendants are a rabbinic family – I believe in Jerusalem – with a surname starting with W, something like Wittkind?? If there’s anyone out there who has information than can lead to them, please let me know.